Using infrared imaging before and after shows Firefly light therapy results. 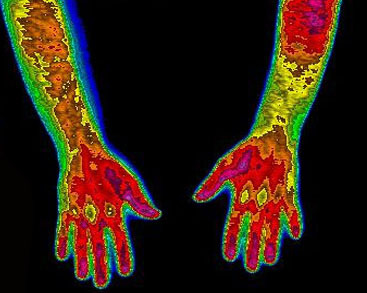 Firefly light therapy results can be compared using infrared imaging, or thermography that reveals increased blood circulation. 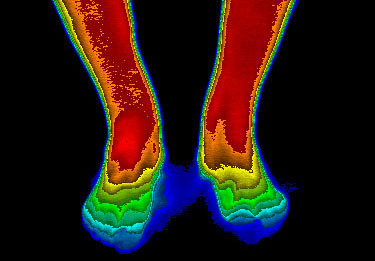 A baseline infrared image is taken before Firefly light therapy and used to determine the proper course of treatment. This image is then stored on the computer system. After an initial course of 4-6 treatments, the scan is repeated. Changes in blood circulation are noted and used to assess the efficacy of treatment and determine prognosis. 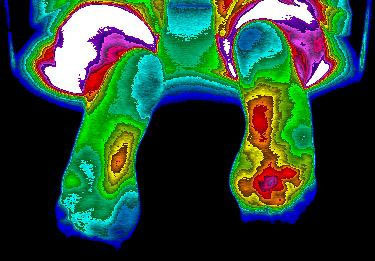 Below are some examples of pre- and post-treatment infrared scans. 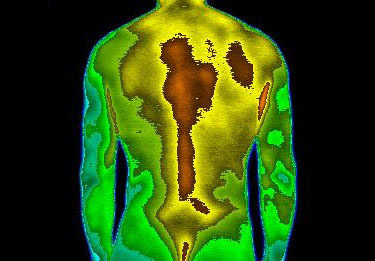 Orange to red warmer colors in the pretreatment images indicates inflammation and pain. 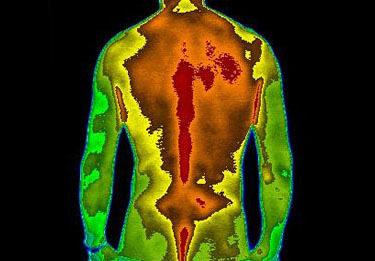 Patients experiencing numbness and poor circulation before treatment show warmer colors after treatment indicating increased blood circulation. The cool colors indicate poor circulation. Large red area reveals car accident pain. 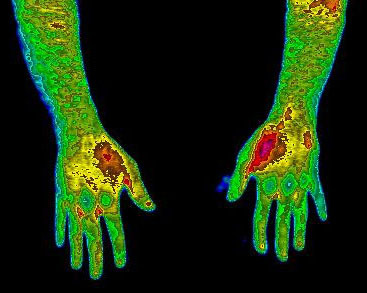 Warm areas indicate a severe wrist injury. 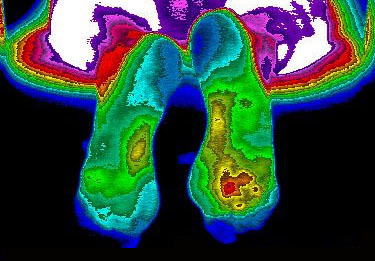 Warm areas indicate painful neuropathy of the feet. The warm colors show amazing improvement. Note the dramatic reduction in inflammation. Pain and inflammation are nearly gone. Neuropathy is barely visible post treatment. “I had a skin rash on my hands for three months that was not only extremely painful, but I was incapable of using my hands and had lost my job. I had received a couple of different diagnoses and had tried several different treatments without any results. Ready for These Kind of Results? Call 619-886-5580 to Order Firefly Today.